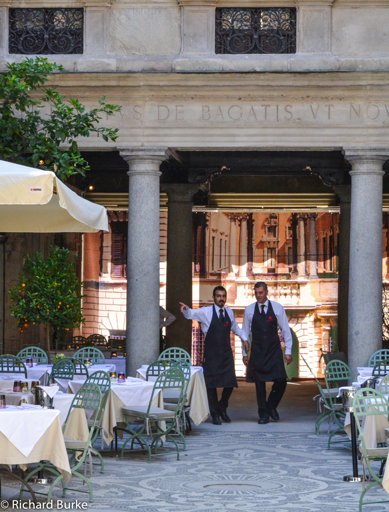 As we strolled the streets of the bustling city of Milan in Italy we noticed many restaurants. I guess in Italy they are all Italian restaurants. Even the Chinese restaurants in Milan were set with white table cloths. This place however was surely upscale and minutes before the noon opening we could see the waiters discussing their strategy as they made sure they were ready. Spaghetti Bolognese is basically pasta with meat sauce. It is one of the few things you can get through room service almost anywhere in the world. It is also a cafe standard throughout Europe. Unsure of what to order? it is a safe bet for the unadventurous. This was taken at a Cafe in Milan Italy where you can be sure it is as good as it looks. Buy this or other food images at my commercial site by clicking here. One of the most beautiful buildings we saw in Amsterdam was Den Waag (The Weigh House) which dates back to the old fortifications of the city. As we walked towards it we knew nothing about it. We thought it was a castle and maybe we could get a tour. Turns out it is now a cafe and quite a good one. 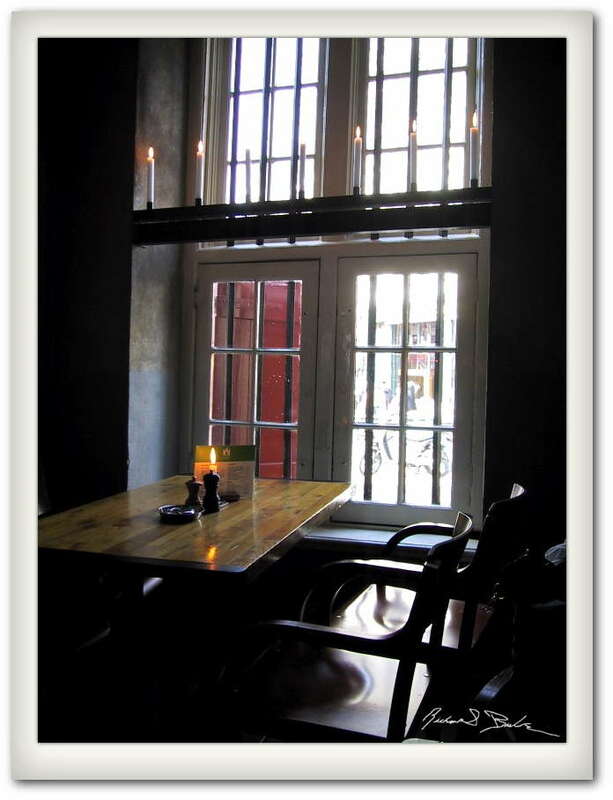 Being hungry, we stopped for lunch and the food was as wonderful as the candlelit interior. See more of my photos of Europe by clicking here. My wife is a French teacher but eighteen years ago when we went to a Parisian restaurant I asked her what “Crevettes à l’avocat” meant on the menu. She had not been teaching French for a while and looked at me and said. “Shrimp in the Style of the Lawyers”. When the shrimp dish arrived with beautiful sliced avocado we both looked at each other and said ohhhh that makes more sense. Last year when we dined in Paris and I ordered we both laughed again. You can see more prints in my European gallery by clicking here. Point a camera in Paris and you have no idea what will pop up in front of your lens. After a lovely dinner at a French Cafe, while composing an image for my new book, this young fellow stuck his face in my camera and yelled “Bienvenue A Paris!” trying to startle me. Instead of reacting I clicked the shutter and quickly took three pictures of him causing us both to laugh, ahh Paris. You can buy a print of this image at my commercial gallery by clicking here. Spaghetti Bolognese is basically pasta with meat sauce. It is one of the few things you can get through room service in whatever city you are at throughout the world. It is also a cafe standard throughout Europe. Unsure of what to order? it is a safe bet for the unadventurous. This was taken at a Cafe in Milan Italy where you can be sure it is as good as it looks. Buy this or other food images at my commercial site by clicking here.